SIR Paul McCartney is a former Beatle who boasts 18 Grammys and musical collaborations with almost every artist on the planet under his belt. But these credentials were apparently not enough to earn the 73-year-old a pass to a Grammys after party after footage emerged appearing to show him being rejected. "How VIP do we gotta get? We need another hit guys!" as security refuses the trio entry to the bash at the Argyle in Hollywood. 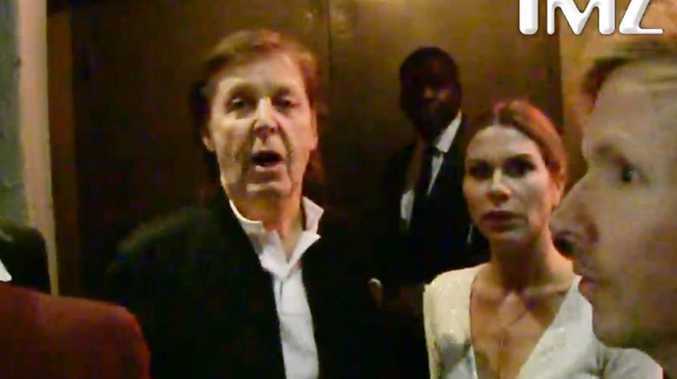 The party was hosted by the 26-year-old rapper Tyga, who appeared unsure of how to respond after being asked how it felt to have Sir Paul denied entry to his event as he left later in the evening. "Maybe it's the fact that we are younger than Sir Paul and it's a new generation… and we really club when we go out."